Talent: Vocal Performance to "Being Alive"
CMU Deans List Fall 2017. Honor Roll student all four years at Bedford High School. Earned the following scholarships: The Scottish Rites Scholarship, The Special Talent Scholarship at CMU, Lauren Yates Memorial Scholarship, The Bedford Community Foundation Scholarship, and the Bedford High School Choir Scholarship. I have participated in more than 25 musicals. I have a rescue dog at home. I have volunteered with CHAMPS Camp which helps children cope with having an anticipated loss of a loved one with Cancer. I have donated 10 inches of my hair to Locks of Love. I have two double-jointed arms and two crooked pinky fingers. Growing up with a Mom as a nurse, I learned how important it is to care for other people. She started my passion for volunteering and helping local organizations. She has also been my inspiration to take a career in the medical field because I can show my passion for helping others. 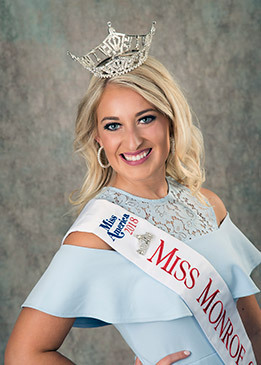 Of all the ways you could succeed in your life, why have you chosen to succeed in the Miss Monroe County competition? The Miss Monroe County Pageant provides a way for me to make a long-lasting change in my community. It is important to have a strong woman who fights for what she believes in and makes our community a better place. This organization will give me that opportunity. Educating and increasing awareness about mental illness, because one in five Americans are affected by mental health conditions.